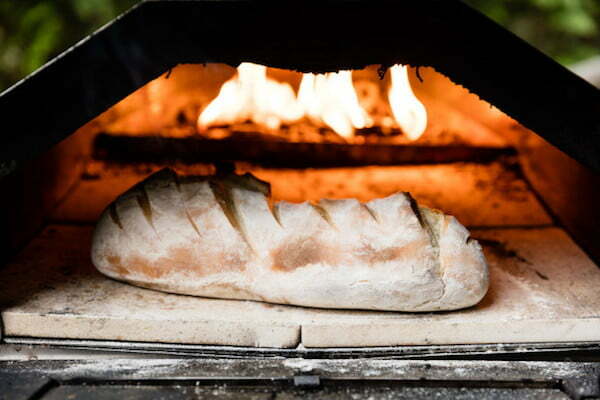 After launching its self-titled, portable wood-fired oven to Kickstarter success in 2012, the Edinburgh, Scotland-based Uuni decided not to sit back on its gains and instead opted to one-up itself. With four years of research and development in the bag, the European company returned to its crowdfunding roots this month and launched the Uuni Pro. What sets the Pro apart from its first-generation kin is that aside from featuring the ability to burn wood as fuel, owners also have the option of using wood pellets, charcoal, or gas. Though it’s not necessarily a first of its kind, its ample cooking surface and versatility do put it in a class all its own. While the Uuni’s portability added to its intrigue and attractiveness, the Uuni Pro is intended to be an owner’s home-based solution to everyday baking. Be it a vehicle for whipping up the perfect loaf of bread, expertly cooking a heap of prime rib, or baking a large, 16-inch pizza, the Uuni Pro (and its attachments) provide an incredible amount of flexibility. Priced at $499 for early backers — which represents a $150 discount off its intended retail price of $699 — the Uuni Pro comes standard with all the bells and whistles which give it its unique quad-fueled skill set. Once it eventually ships, backers can expect to receive a standard wood and charcoal burner, in addition to Uuni’s patent-pending Pizza Door and Pizza Peel, a window-boasting Pro Full Door, a Pellet Burner, and a Gas Burner. Furthermore, backers can expect to get their hands on a Uuni Pro by Fall of 2017. As of this writing, the Uuni Pro had already raised an impressive $84,000 on Indiegogo with a month left in the campaign.